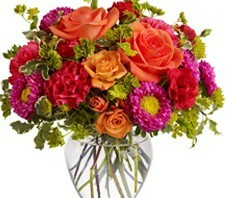 The Forever Dear Arrangement is a colorful assortment of our finest blooms. 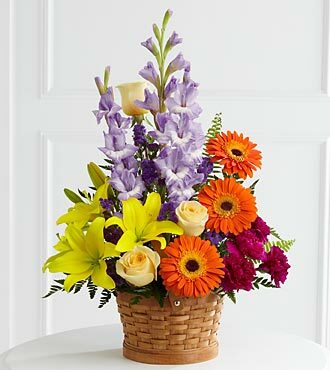 Crème de la Crème roses, yellow Asiatic lilies, orange gerbera daisies, lavender gladiolus, plum carnations and purple statice are accented with leatherleaf and sword fern stems. Gorgeously displayed in a natural buff wood-chip basket, this arrangement will add to the natural beauty and serenity of their final tribute. SMALL basket includes 15 stems. 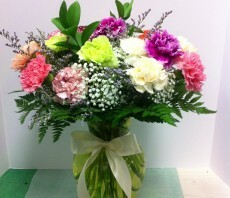 MEDIUM basket includes 19 stems. 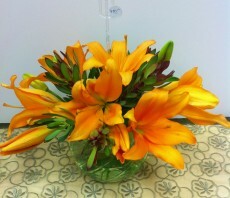 LARGE basket includes 28 stems. Glass vase, bow and tulip colour may vary. 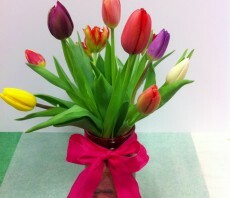 Small size includes 10 tulips, each increase in price includes and additional 5 assorted tulips.